The fireplace mantel may be simple, with clean lines and smooth features, or it may be more elaborate, with bolder colors and intricate detailing. 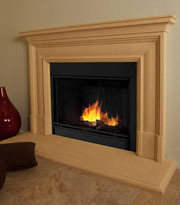 There are many styles of mantels to consider when choosing a fireplace mantel for your office. When choosing a mantel, you may choose to complement existing décor, or you may wish to make the mantel the focal point of the room. Fireplace mantels can be made from a variety of materials that come in a wide range of color options. You may choose a mantel that is more simplistic in style for a low key appearance. Perhaps you would prefer a fireplace mantel with lots of intricate details that appears larger than life to express your business. If your office is based more on comfort, a rustic look may be preferred when selecting a fireplace mantel. Whatever you decide, the fireplace mantel will emphasize the feel of the room and should express your business personality. SoCal is a large provider of fireplace mantels in Los Angeles that range in designs and styles to meet the needs of your office. You might consider contemporary fireplace mantels, or you may like a more traditional style, or even a fireplace mantel with a more rustic appearance for comfort and appeal. Custom mantels may be created with one of our design experts for a style that uniquely fits your office.